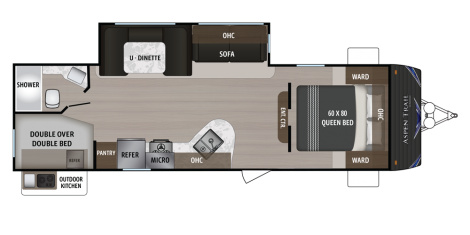 Aspen Trail has the most dynamic range of floorplan options to fit any camping style. 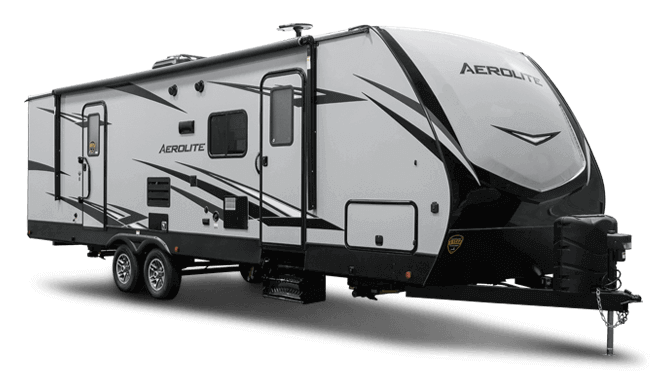 With more standard features than its competitors and a focus on quality, value, and design, Aspen Trail delivers the best RV in its class. Cargo Carrying Capacity 3427 lbs. Cargo Carrying Capacity 3448 lbs. Cargo Carrying Capacity 3522 lbs. Cargo Carrying Capacity 3370 lbs. Cargo Carrying Capacity 2001 lbs. Cargo Carrying Capacity 1918 lbs. Cargo Carrying Capacity 2062 lbs. Cargo Carrying Capacity 1956 lbs. Cargo Carrying Capacity 3736 lbs. Cargo Carrying Capacity 3307 lbs. Cargo Carrying Capacity 2789 lbs. Cargo Carrying Capacity 2854 lbs. Cargo Carrying Capacity 2252 lbs. Cargo Carrying Capacity 3416 lbs. Cargo Carrying Capacity 3387 lbs. Cargo Carrying Capacity 3068 lbs. Cargo Carrying Capacity 3215 lbs. Cargo Carrying Capacity 3301 lbs. Cargo Carrying Capacity 3116 lbs. Cargo Carrying Capacity 3090 lbs. Cargo Carrying Capacity 3179 lbs. Cargo Carrying Capacity 3342 lbs. Cargo Carrying Capacity 3241 lbs. Cargo Carrying Capacity 3083 lbs. Cargo Carrying Capacity 2020 lbs. Cargo Carrying Capacity 2347 lbs. Cargo Carrying Capacity 2567 lbs. Cargo Carrying Capacity 1898 lbs. Cargo Carrying Capacity 2992 lbs. Cargo Carrying Capacity 2997 lbs. Cargo Carrying Capacity 3046 lbs. Like the name itself, the Aspen Trail features amenities fit for long outdoor retreats. At Dutchmen, we’re all about more. 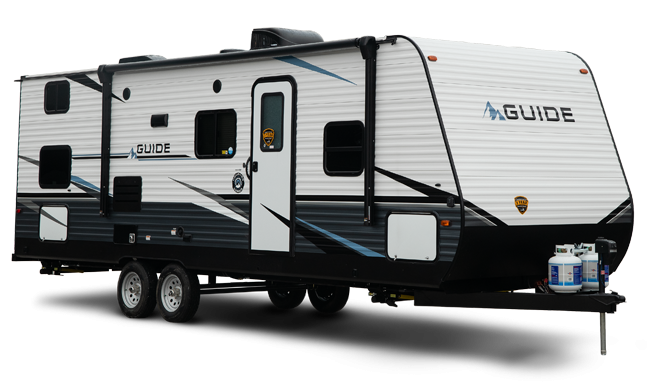 Starting with more space to get around the RV with an impressive 82-inches of interior height, so even your tallest family members won’t need to worry about where they walk. Plus, when you expand the slide-outs, you’ll find you have 6-feet of headroom to move about. 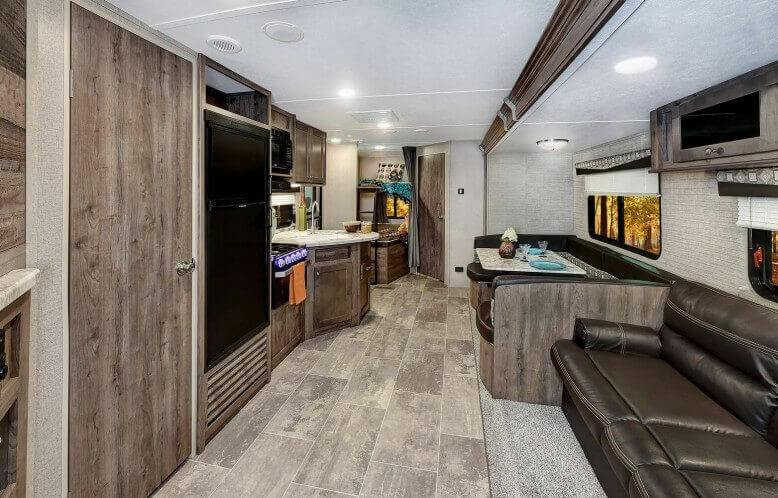 The Aspen Trail features the only U-shape dinette in its class that converts to a regular non-U-dinette when you need it. 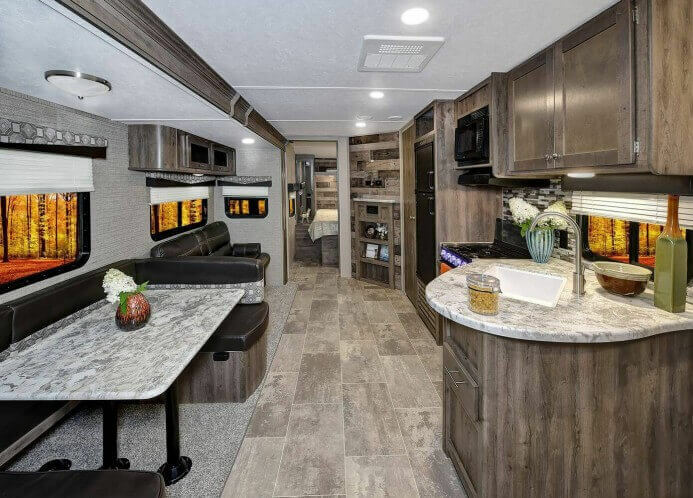 This multi-function dinette configuration ensures you’ll have space to enjoy every meal, while offering a place to nap, play, or simply put your legs up. Forget RV kitchens of the past. 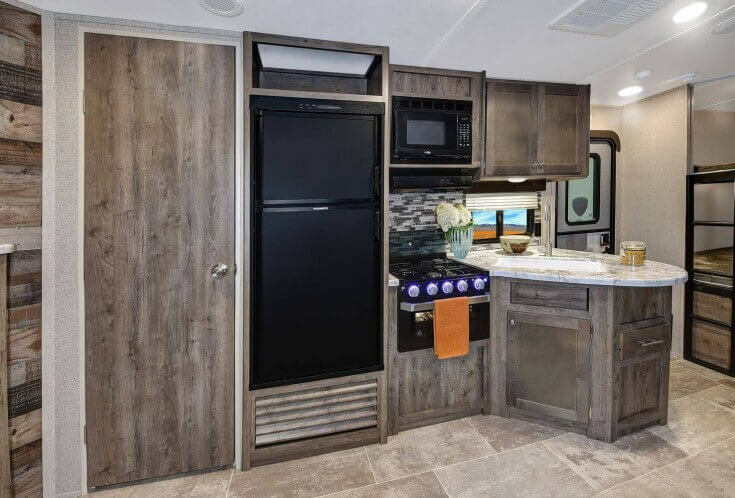 With the seamless countertops and sink covers in these travel trailers, you’ll have more than enough room to get around, cook up a storm, and serve the whole family a meal they'll remember. 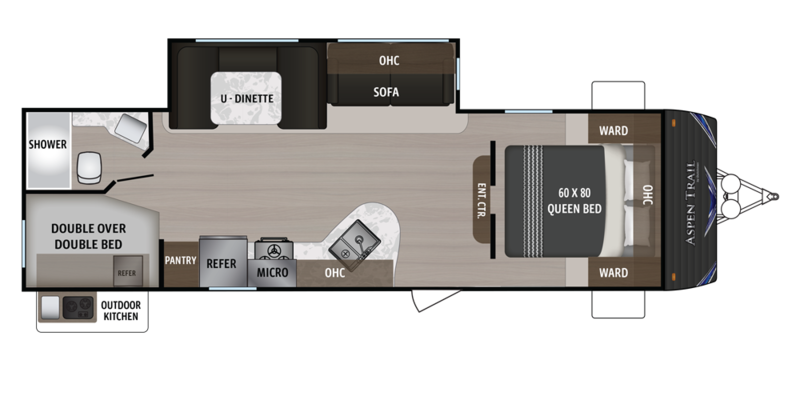 All the thrill of getting away combined with premium space and traditional comforts. 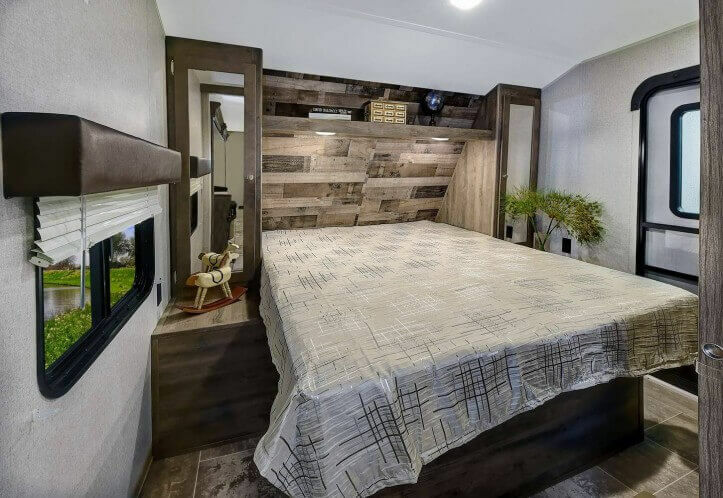 That’s what a true residential 60”x80” queen-size bed brings to adventurers in our Aspen Trail travel trailers. 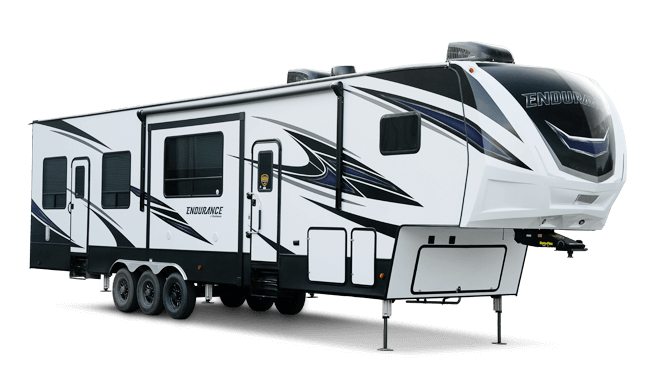 With a fully-enclosed underbelly, all of your RVs vital functions are kept out of the elements, which helps to ensure critical lines don’t freeze and that unforeseen bumps don’t damage sensitive systems. Plus, this extra layer of protection means you can travel further into the year. 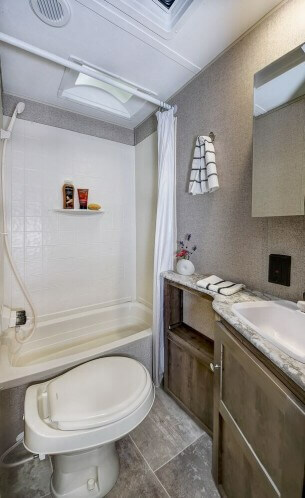 You decide how you want your Aspen Trail’s interior to look. We’ll do the rest.